Prior to this weekend’s Development Camp we posted previews with LA Kings prospects JF Berube, Kevin Gravel and Jordan Weal. Now, we turn our attention to perhaps the top prospect in camp – forward Tyler Toffoli. 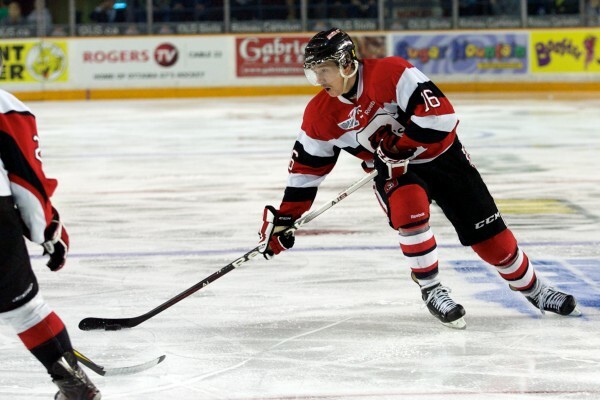 Drafted in the second round of the 2010 NHL Draft, Toffoli has been the reigning sniper in the Ontario Hockey League the last few seasons. Two years ago he led all of junior hockey with 57 goals. He followed that up with 52 goals this past season and his second consecutive 100-point campaign. Given his probable key role among the Kings forwards in coming seasons, he was also selected to be part of a small group of players who were in LA practicing during the playoffs, in case an injury or opportunity arose (in hockey lore, these groups are known as the ‘Black Aces’). MM: How excited to be back in LA? TT: It’s awesome. It’s always nice to be around all the guys and knowing that hockey season is kicking into gear. I’m excited and I’m just going to take it all in like I have the last few years. MM: In terms of your development, was the one preseason game you played in last fall valuable on some level? TT: I think it was. It was a lot of fun and was a huge experience. I remember before the game I was nervous. Even after the game, i was so excited that I had a good game. Just being able to play – I played with (Trevor) Lewis and (Ethan) Moreau. It was an incredible feeling when it was finished and I just want more. I hope this year I can get into a couple more games and try to crack the roster. But, we’ll see what happens. MM: And how about the experience during the Kings playoff run? TT: That was a good experience too, watching the games and stuff. We weren’t really around the team too much. But, seeing how it all came together and the huge run – just being in the environment, in the same atmosphere with all the hard work that resulted in them winning the Cup. We would watch them practice a couple of times and it was a lot of fun. I was proud to be part of it. MM: Would you say you have a bit of an advantage over most of the retuning campers, in the sense that you met Darryl Sutter when you were here a few months ago? TT: We talked a little bit when I was here with the Black Aces. He would come in and talk to all the boys when we were in the gym and stuff. When I go on the ice, it’s all about first impressions. So, the first time we’re on the ice together, I just want to do my best and catch his eye – just like everybody else is going to try and do. MM: It’s no secret that you’re one of the top prospects in camp this time around. There will be a lot of eyes on you from fans and management. What should people be watching for? TT: I’m just going to go out there and try to work as hard as I can. I want to show everybody I’ve been working hard on the areas I’ve been trying to improve in. Obviously, my whole game needs to be better to play in the NHL. But, I’ve been working hard. So, I just want to show that I’ve been getting better. Hopefully, everybody else will see that as well. MM: In terms of next season then, where is your head right now? More Manchester or more LA? TT: My mindset is to play in the NHL. So, I’m going to do everything I can this summer. Then, I’m going to show up in training camp and play to the best of my ability. My goal is to play for the LA Kings. That’s where my mindset is and we’ll just have to play it by ear and see where it goes. MM: Among the guys in camp, which other prospect or two have you bonded with the most? TT: Veysy (Linden Vey) and Andy (Andreoff). We’re all pretty similar in age. I played against Andy the last four years too. So, we knew of each other. Vey was my roommate here before, so we were together all the time. The three of us hung out quite a bit. MM: Andy’s your roommate this time. Better to have him as a roommate and a teammate than to have that freight train running you over in the OHL, right? MM: No more Ray Kaunisto though. Who’s taking over as the king of the chirps? TT: Not me, that’s for sure. We’ll see who it is though. We have a couple new guys in camp this year. Maybe one of them will step into the role. It’s not going to be, that’s 100% certain! Tanner Pearson – He’s a good player who works hard and he has a really good shot. He had a really good year last year and it’s good to have him in camp here. Barclay Goodrow – He was a on a good team (Brampton Battalion) and they really played a good system. He plays very physical and he does a good job at what he tries to do out there. Marcus McIvor – He’s a big, stay-at-home dman. He also plays very physical and blocks a lot of shots. Overall, he’s a good defenseman. Colin Miller – Because he was in the Soo, we didn’t play them very much. But, he’s really quick and he’s good with the puck. He seems like he’s a really smart player and he was a good pick. MM: Back to Andreoff, what’s something about him that people might not know? TT: He has a really good tan at all times. For those not fully in on the joke here, we tweeted some comments from Jake Muzzin during the playoffs about Toffoli and his attempts to get a tan. Toffoli will be sticking around LA for a few weeks after camp is over too. That will give him plenty of time to continue working on his tan…and his talents. You can also get a full look at the roster for this year’s Development Camp by clicking here. Down below we’ve also posted links to our preview articles from earlier in the week, as well as links to a few of Toffoli’s prior MayorsManor visits. Good stuff Mayor… that’s why you’re the best!